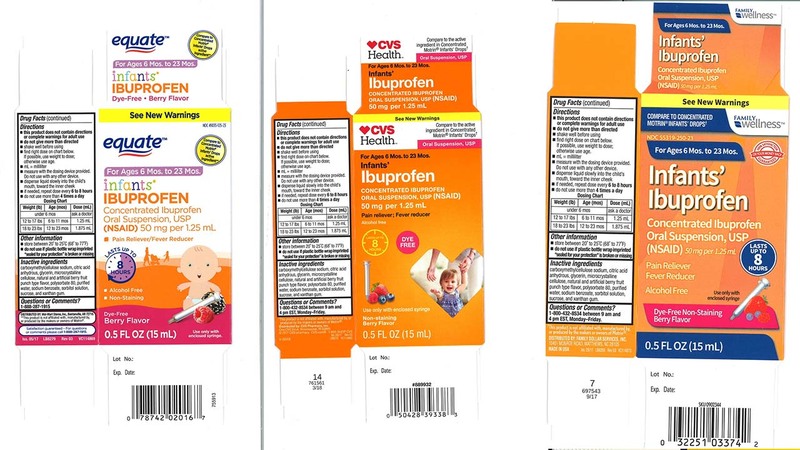 Tris Pharma has voluntarily recalled three batches of concentrated ibuprofen infant suspension (liquid ibuprofen) sold at Walmart, CVS and Family Dollar. The company has issued a recall report that the products may contain higher levels of ibuprofen. The products are used as analgesics and fever reducers. Infants more susceptible to a higher level of drug discovery may be more susceptible to persistent NSAID associated with kidney damage, according to a press release. Children may experience nausea, vomiting, epigastric pain or diarrhea. The company said tinnitus, headache and gastrointestinal bleeding were also possible. Sold by Wal-Mart Stores Inc. According to the company, liquid ibuprofen has not revealed any official complaints. However, those who have problems with the recall should consult their doctor. Those who have questions should contact Tris Pharma at (732) 940-0358.